The Boston Center for Facial Rejuvenation can now treat two areas at the same time, reducing overall treatment times to just 35 minutes. The Boston Center for Facial Rejuvenation is excited to announce the arrival of DualSculpting™ capabilities. With a second CoolSculpting machine, two areas can be treated during a single appointment. Practice founder, Leonard Miller, MD, and his associate, Sean Doherty, MD are proud to be two of only a few cosmetic surgeons in New England to offer this service. 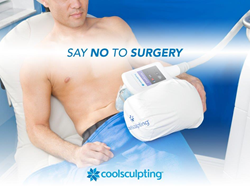 CoolSculpting is a cutting-edge treatment that utilizes cool temperatures to eliminate unwanted fatty tissue. Through a process known as Cryoplipolysis, fatty tissue is slowly ‘frozen’, damaging the cells, which are then metabolized by the body. Each body sculpting treatment takes just 35 minutes. In three to four months, patients can see up to a 25% fat reduction along the treatment area. For even greater results, second treatment can be safely performed. Giving patients the option to treat two areas at one time, using two CoolSculpting machines, means overall treatment time is cut in half. Known as DualSculpting™, two areas can be treated at once, including both upper arms, thighs, or flanks. As safe and effective as traditional CoolSculpting, DualSculpting™ is performed in the same comfortable treatment room, without the need for anesthesia. The Boston Center for Facial Rejuvenation is proud to be one of the few practices in New England to bring the benefits of DualSculpting™ to patients. Dr. Leonard Miller is a board certified plastic surgeon with more than 25 years of experience. Known for consistently achieving exceptional results, Dr. Miller has an artistic eye for physical proportions. Over his notable career, Dr. Miller has cultivated a mix of innovative procedures with his own, advanced techniques. Today, Dr. Miller’s focus is on rejuvenating procedures for the skin, face, and neck. Dr. Sean Doherty joined the Boston Center for Facial Rejuvenation in 2017, bringing with him decades of experience in rejuvenating plastic surgery techniques for the breast and body. An alumnus of Columbia University and Tufts University School of Medicine, Dr. Doherty is board certified by the American Board of Plastic Surgeons and routinely presents at plastic surgery conferences around the world. If you would like to learn more about CoolSculpting, or the option for DualSculpting™, contact the Boston Center for Facial Rejuvenation at 617.735.8735 or fill out the patient Contact Us form. Appointments can be made at either the Boston or Brookline office. More information can also be found from the makers of CoolSculpting.